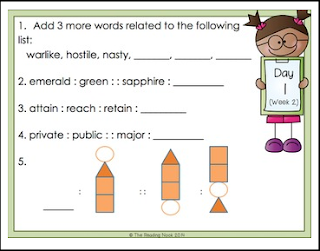 The activities were created for 5th grade students to work on as morning work but they could also be used at a center or in any other way you choose. They could just as easily be used for advanced 4th graders or 6th/7th graders as a review. I put them up on the board each morning for students and then discuss the answers at a set time each day. This download includes one week’s worth of activities. **My email is thereadingnooktpt@gmail.com if you need to contact me.